Nightrage Rising is the second book in The Unseen Chronicles by P.S. Broaddus and it follows the story of blind Essie Brightsday. She’s had a lot to deal with in the past, including vicious dragons and basilisks. Now, a terrible threat hangs over the city of Plen where her family lives and civil war looms ahead. Essie teams up with her cat, Tigrabum, and her friends, Illiana and Sam, to stop a sinister plot orchestrated by a devilish cult to set the city against itself. But can they stop the rise of the evil Nightrage? The story begins with action, and it is not just a way of luring readers into the book; the action grows every second as the story progresses. The first lines of the story already create an atmosphere of tension: “Running for my life was not a part of the plan. To be fair, there hadn’t really been a plan. Which is why I’m hurtling down unfamiliar streets with three Ratliff thugs on my tail." The narrative voice is gripping, absorbing, and it carries a powerful force in the first person.The dialogues feel real and I enjoyed how the author allows the accents and the unique personalities of the characters to shine through the dialogues. The prose is lofty, polished, and rings with peculiar music. P.S. Broaddus has a gift for setting and creates visuals that allow readers to match the action to the places in which it takes place. Nightrage Rising is deftly plotted and beautifully written, with characters that readers will love and a unique sense of humor that propels readers on. Masterful handling of conflict and storytelling skills make every page of the narrative engaging. I really like the way Nightrage Rising: The Unseen Chronicles Book 2 is put together. When I picked this book, I wasn't in the mood for a long slow Game of Thrones type build up. I wanted something good that gets straight into the action. P.S. Broaddus delivered admirably. I am pleasantly surprised at just how much I loved Nightrage Rising. There is a glut of this type of novel on the market right now, and it is sometimes hard to pick a good book unless you have read the author before. I had never read or heard anything about P.S. Broaddus. I simply read the book description and a couple of pages, and I was hooked. I really loved the maps at the beginning of the book. I loved the strong females in the story. Women are often portrayed as damsels in distress or needing someone to protect them. I like the way P.S. Broaddus writes. I like the way the author lays out the plot, starting off with a great action scene, subtly filling in background and keeping us totally engaged in the action. I don’t know if P.S. Broaddus is a man or a woman. My gut says “man” based on the great writing in the action sequences but part of me screams “woman” because of how well the women are portrayed. It doesn't matter. This is a great author. The plot is great and very fast paced. The characters are fantastic. I loved Essie Brightsday. It doesn't get much better than the blind daughter of a prominent family as a protagonist. Nightrage Rising: The Unseen Chronicles Book 2 is a great read. 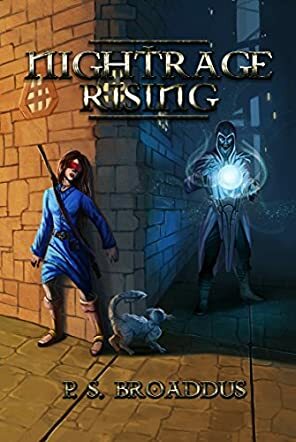 Nightrage Rising: The Unseen Chronicles Book 2 by P.S. Broaddus is the story of Essie Brightsday, an unlikely heroine who happens to be blind. That doesn't stop her though; she is brave and fearless and a good match for any foe. The city of Plen is full of danger and magic and Essie gets herself into all kinds of trouble. And who doesn't love a talking cat? I think the story is well written and the author really has created a believable world. It has a good pace and plenty of action scenes, which I think will appeal to kids. P.S. Broaddus has created an exciting world in Nightrage Rising: The Unseen Chronicles Book 2. I realize I have missed out on Book 1, but the author includes enough information so I know what is happening and who Essie is. This book would appeal to fantasy fans and probably young teens aged 12- 15. I think some of the themes would be better understood at this age level. I would definitely recommend it. I think it could also be a good book for people who love the likes of Harry Potter, and who want to read more fantasy books as they get older. I also think that having a character that is impaired, being blind, is encouraging to kids who have a disability themselves. It shows that they can still have adventures in spite of their physical capabilities. I think that is an important topic to include in children's books, as they want to relate to the protagonist.